This year we had 12 entries. 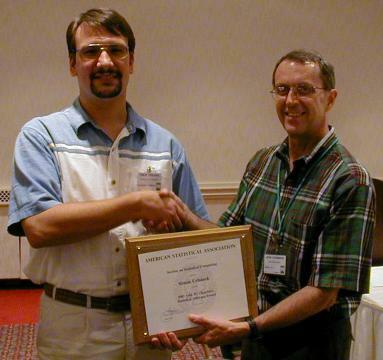 The award is shared by two winners. Dustin Tran (Department of Computer Science, Columbia University) for edward, a Python package for probabilistic modeling, inference, and criticism. Nan Xiao (School of Mathematics and Statistics, Central South University, China) for liftr, an R package for persistent reproducible reporting. Thanks to the Chambers Award review committee consisting of Patrick Breheny (chair), Deepayan Sarkar, and Yihui Xie. 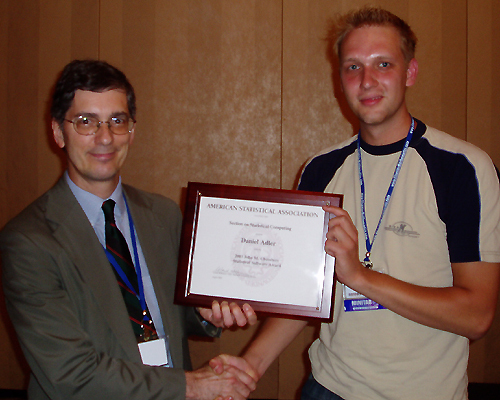 Lee Wilkinson, Chair of the Section (left), and Daniel Adler(right). Taken at the Joint Computing and Graphics Sections Mixer/Business Meeting in San Francisco (8/03). Interactive software for the graphical analysis of trees. Simon Urbanek (left) and John Chambers (right). Taken at the Joint Computing and Graphics Sections Mixer/Business Meeting in New York City (8/02). From left to right: Brian Smith, John Chambers and Sylvia Winkler. Taken at the Joint Computing and Graphics Sections Mixer/Business Meeting in Indianapolis (8/00). The interactive software CASSATT has been developed to visualise high-dimensional, multivariate data using parallel coordinates. CASSATT is platform independent and widens the range of methods for analysing parallel coordinate data. CASSATT uses interactive tools to extend the basic graphic displays. BOA is an S-PLUS/R program for carrying out convergence diagnostics and statistical and graphical analysis of Monte Carlo sampling output. It can be used as an output processor for the BUGS software or for any other program which produces sampling output.